. Smoke Filled Lungs directed by Jason Cabell and starred by Frankie Faison (The Silence of The Lamb, Hannibal), Sasha Mitchell (Step by Step, Dallas) was world premiere in International Film Competition Festival (IFCOM) in Indonesia. 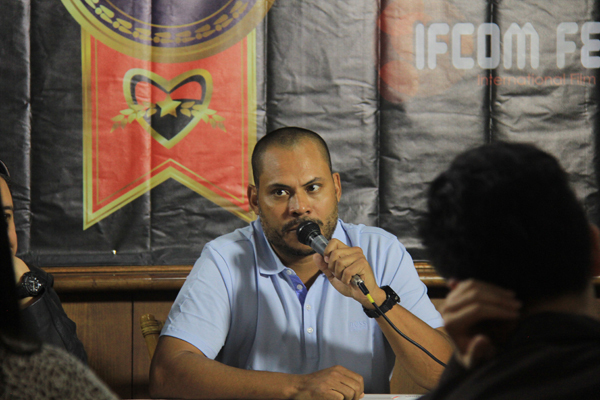 "I’m so proud to have the world premiere of Smoke Filled Lungs in IFCOM.” said Jason Cabell happily during his visits to Indonesia while attending the film discussion of his movie. Smoke Filled Lungs received International Gold Award in the Feature Film category and Special Jury Award for Frankie Faison. Smoked Filled Lungs tells a story about a retired war veteran struggling with a prescription drug addiction and his troubled teenage nephew rediscover life together on a journey to see their grandfather. Jason Cabell during his winning speech in Kartika Chandra Hotel, said that he would like to dedicate this movie to all the veterans. Jason Cabell who has spent 20 years in the army said "I’ve been in navy seal for 20 years and traveled to 70 countries around the world but there is nothing like the feeling of being a film director.” he said during the film discussion in IFCOM at the Russian Cultural Centre, Jakarta.